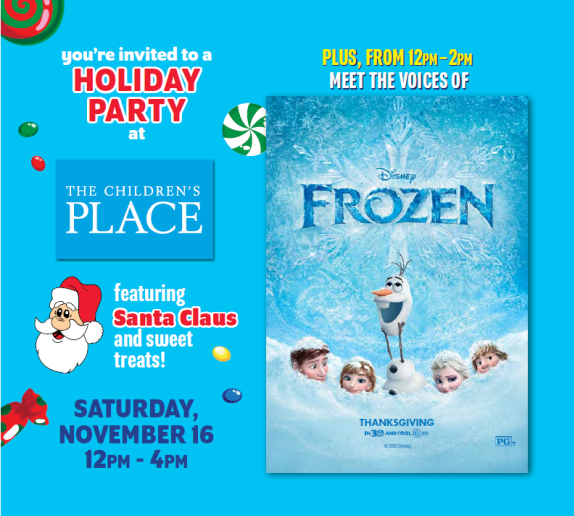 This Saturday, November 16 bring your children to The Children’s Place at The Farmer’s Market on Fairfax and Third to meet the stars from the upcoming comedy adventure Frozen. Santa Claus will be handing out sweet treats. Arrive by noon to meet some of the movie’s cast members. The Disney movie will appear in theaters November 27. Stars from the highly-anticipated film will include Josh Gad (The Internship, Love & Other Drugs, Broadway’s The Book of Mormon), provides the voice of affable snowman Olaf. Also appearing are Eva Bella, who voices Young Elsa; Spencer Ganus, who voices Teen Elsa; and Tyree Brown, who provides additional voices for the film. Fans can get ready for the film by purchasing a Disney t-shirt at any Children’s Place retail store—including The Farmer’s Market location—and get a $5 movie ticket to see Frozen with every Disney tee purchased. Enjoy a Frozen day in sunny Los Angeles, and celebrate Walt Disney Animation Studios’ next big-screen adventure.